The Greek island of Corfu is a place of exceptional natural beauty. The island is located in the northernmost corner of Greece’s Ionian Islands. Beautiful crystal clear waters surround the island while pleasant weather conditions make it an ideal destination for luxury holidays. The ancient capital Corfu town features many historic monuments; the old quarter has been designated a UNESCO world heritage site. The island is lush with greenery dominated by over two million olive trees. Emerald mountains cover the capital on one side while the sea surrounds the island town with a number of small islets. For nature lovers Corfu is a paradise. The open sea and the landscape offer scope for all manner of tourists to enjoy an ideal holiday getaway. 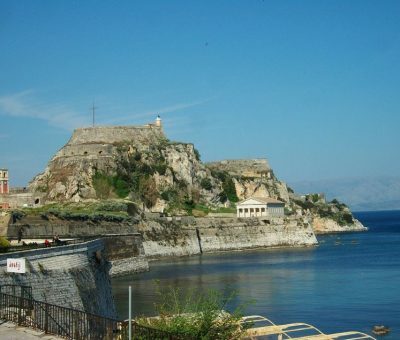 Corfu offers a wide variety of activities for visitors. Exploration of underwater seascapes, pleasant hikes, picnics in the open air, trips to the harbour and leisurely strolls to soak up the beauty of the place are just some of the attractions available to visitors coming on family holidays to Corfu. Byzantine churches, Venetian fortresses, palaces, museums and a lively nightlife also keep visitors entertained while they are in this majestic location. The island offers some exceptionally beautiful resorts and accommodation for visitors, and there is a huge of selection of restaurants at which to enjoy the local cuisine and wine. Beach games and musical concerts keep visitors busy while they are in Corfu; they can also enjoy a bike ride around Corfu town to take in the historical monuments. A boat ride to explore the island’s beaches is the perfect way to enjoy some of the best natural views around Corfu. Corfu’s beaches are considered to be among the finest in Greece, particularly on its west coast and these sandy bays are especially popular with families. For the sporty visitor, Corfu even has a cricket season and there is also an 18-hole golf course. Corfu has mild winters and long, hot summers and its beaches can be enjoyed from mid-May until September. The west coast has a more moderate climate than the east. Thanks to the rains that fall intermittently from September to May, Corfu is the greenest of the Greek islands and the landscape is characterised by thousands of olive trees. Part of the British Empire for much of the 19th century, Corfu is especially popular with British tourists. Visitors are diverse and include families on a beach holiday, couples flying to a romantic hideaway and singles in search of lively nightlife. For those looking for a quieter, more active holiday, inland Corfu offers great countryside and activities such as horse riding and paragliding.